We’re told Kia’s trying to forge its own path in Europe, and that it’s doing so by launching a swathe of vehicles that differ from parent company Hyundai’s offerings. But what we have here on the face of it might seem to contradict that fact, since the E-Niro is very similar in concept to the Kona Electric. After all, they’re both small SUVs with nearly 300 miles of range, priced just above £30k with the reduced UK plug-in grant and loaded with standard kit. In fact, the car you can see here is the only version we’re getting in the UK. Kia offers a lower-range version elsewhere, but is unable to price that effectively enough to compete with the slightly smaller and cheaper Kona Electric. So instead the E-Niro is here in bells-and-whistles 3 specification, and your only factory options choices are a spread of six colours. It's a very simple car to spec and choose, then. But is it as good as the hype suggests? 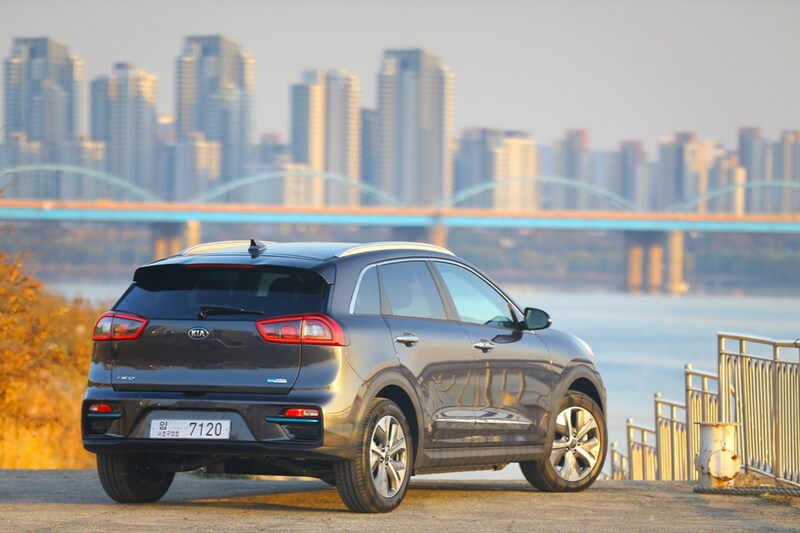 Read on for our full Kia E-Niro review. Hang on - they don’t look like UK numberplates! Good spot. They’re not. They’re Korean, because we’ve been driving these cars in Seoul shortly before they embark on a 4300-mile boat ride to our shores to serve as a training and demo fleet for British Kia dealers as they begin the push for electrification. 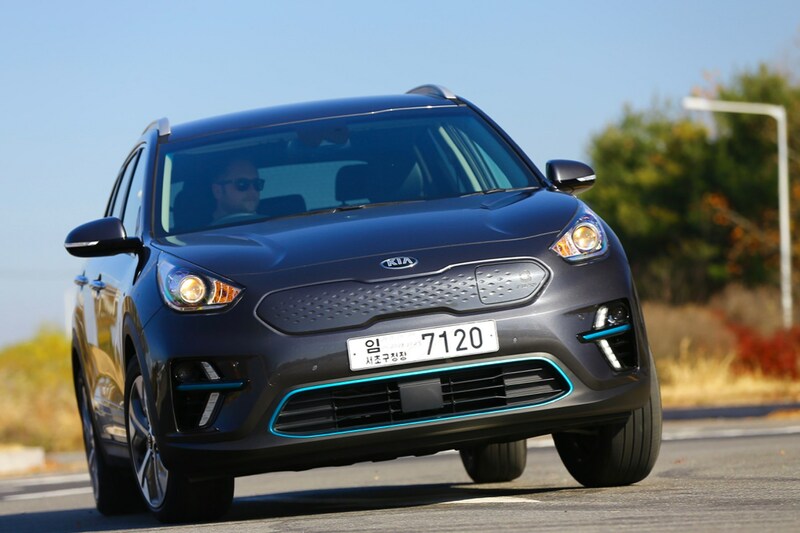 There’s a new Kia EV coming every year for the next three years, you see, and salespeople are going to need their ducks in a row if the Koreans are going to succeed in the zero-emissions marketplace. Our journey begins at the Korean automotive powerhouse that is the twin towers of Hyundai and Kia’s global headquarters, which is in a busy industrial area of Seoul. That means one thing: traffic. There are thousands of motorists constantly jostling for position on the multi-lane expressways that course through the city. It’s a frenetic place to get to grips with a new car, but thankfully at least we’re dealing with a smaller SUV here. The E-Niro’s dimensions place it a sector above its Kona cousin, but it’s still not a large car and feels neatly nimble at low speeds. Electric propulsion helps here too, of course. 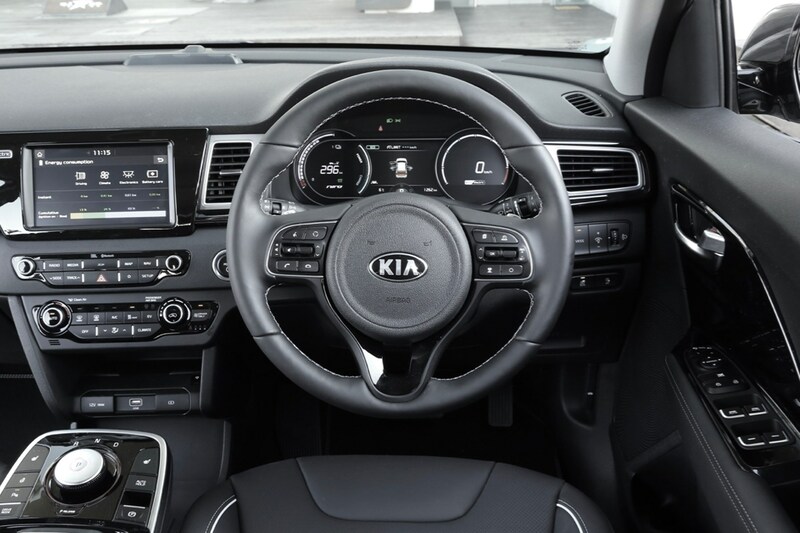 Prod the right pedal and this Kia leaps forward with entertaining urgency. We’re wide-eyed on our first attempt, and chuckling to ourselves regularly thereafter with the immediacy of thrust available here as we nip between lanes to make progress. It’s nothing new for EVs to have 100% of torque available from 0rpm, but our preconceived notion having read the spec sheet of 0-62mph in only 7.5 seconds had set us up for disappointment in the face of Teslas with Ludicrous Mode and the like. Although the thrust on offer might not throw this Kia through the sound barrier, it’s still instantly gratifying and genuinely feels quick. The steering helps here too, because its light weighting (in normal mode at least) coupled with the batteries’ location low in the platform for a favourable centre of gravity gives this 1.8-tonne SUV an agility that belies its mass. Dynamically it’s accomplished in a way that a Nissan Leaf simply is not. Don’t get us wrong here though – this isn’t meant to be a cooking crossover. The real story here is the fact that the new Kia E-Niro is a useable family hatchback with a practical range and a low purchase price. But it shows you don’t necessarily have to sacrifice fun to achieve that. Our plan, once out of Seoul, was to drive towards the town of Imjingak at the southern edge of the demilitarised zone (colloquially dubbed DMZ – the dee-em-zee) between North and South Koreas. Built in 1972 in hope of reunification following the Korean war – which officially never ended – this is where both sides signed a treaty in April 2018 to officially end hostilities before the year is out. 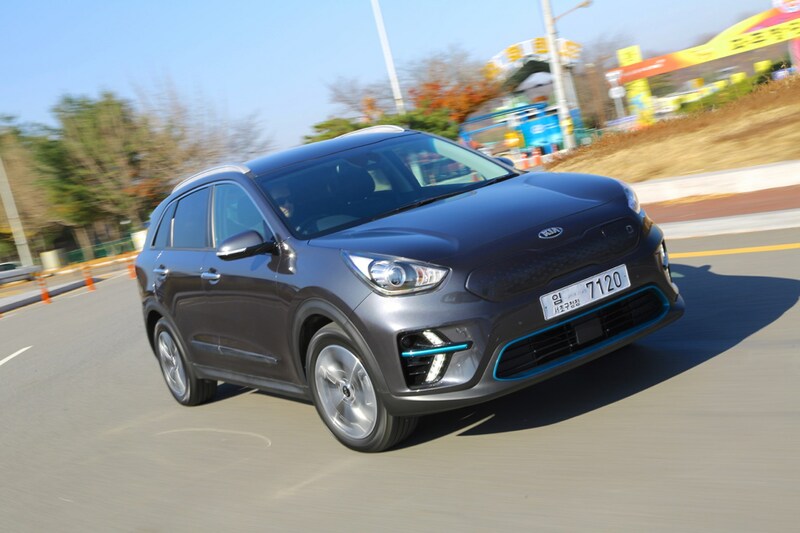 However, it’s also located a few hours’ drive from Kia HQ, meaning a good round trip to test whether that claimed combined range of 282 miles is anything resembling realistic. Once comfortable, adjusting the electric front seats and steering wheel (which oddly for a car at this price isn’t on a telescopic column, so only moves vertically), it was time for the off. Turn the drive-by-wire transmission selector to D, and our tyres squealed over the painted surface towards the car park exit. We started with 345km (214 miles) of range showing on the digital instrument cluster, and we’d decided this has to be a real-world test: no hypermiling, full air-con or heating as required, and full use of the additional creature comforts on the spec list. A chilly wind cutting through the car park meant heating for front seats and steering wheel was welcome, while my mobile was plonked onto the ridged inductive chargepad located under the screen. This last impressed, because within 25km (16 miles) of range used on the car’s batteries, my mobile phone had charged from 86% to full, with a beep and a green light to let me know I could remove it from the pad to avoid unnecessary energy wastage. Not new, granted, but neatly integrated. Things were off to a good start. Once that traffic began to thin it gave us the ideal chance to sample Kia’s latest driver-assistance tech. Again, there’s nothing groundbreaking here, but what stood out was the non-intrusive nature of its operation. The active lane-keeping was subtle enough that we really had to concentrate to feel it nibbling at our trajectory, and the adaptive cruise control metered performance and braking smoothly but with enough urgency that fellow motorists didn’t lose patience. Only once did it fail to spot a van in front had left my carriageway and joined a sliproad, slowing unnecessarily. But that isn’t unusual with contemporary systems. It’s just a reminder that in reality the organic squashy part behind the wheel isn’t anywhere near redundant just yet. Still, the 90kph (56mph) maximum speed limit hadn’t exactly given us the opportunity to wring the neck of the E-Niro just yet, so getting to know its low-speed manners was the aim of the game. The noise struck us – this driveline is highly audible, both inside and outside the car, whining and thrumming as speeds change. Of course, the lack of an internal combustion motor plays a big part here, because the baseline noise level is much lower, but we noticed quite a bit of road noise telegraphed through the 17-inch wheels. The ride felt a little harsh too – the car’s kerbweight doesn’t help here either. But with that said, the seats are great and you’ll presumably have the stereo on for the most part, so neither is a true dealbreaker. We couldn’t test much of the multimedia given we were completely reliant on CarPlay to guide us around Korea, but it’s fair to say the cabin design of the E-Niro is premium enough to command £33k on a Kia forecourt. Once we’d pulled into the vast car park next to the fairground and restaurants at Imjingak Resort – you’d be forgiven for thinking this area feels in any way tense given recent global events, but it doesn’t – we parked up for some lunch. The nearly flat boot floor in the E-Niro made for a nearly comfortable perch to sit on while we consumed our individually wrapped sandwiches (single-use plastic is ubiquitous in Korea, but then so is effective and rigorously enforced recycling legislation…). This gave us a chance to consider the styling of this car against the other Niros – there’s a mild-hybrid model and a PHEV on sale too. You’ll spot the EV by its bespoke front and rear bumper designs, and an aerodynamically friendly closed version of Kia’s family Tiger Nose grille design. 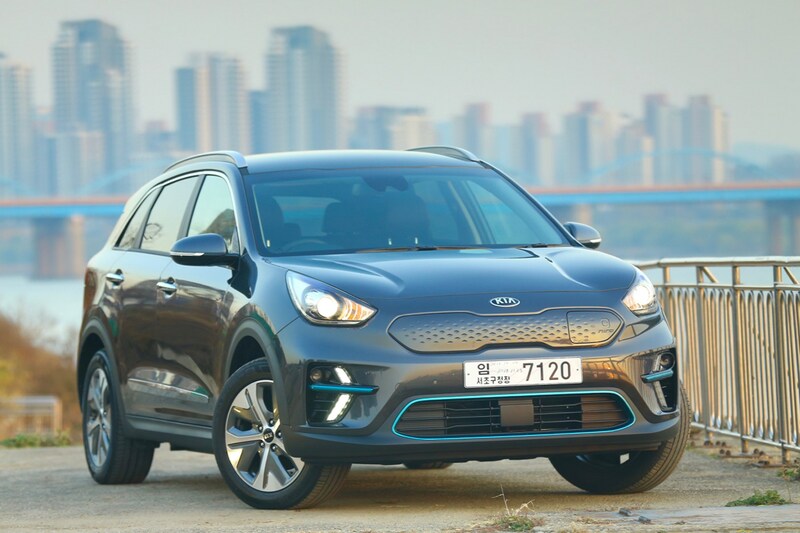 Why is the Kia E-Niro an SUV? It also gave us pause to consider why Kia’s building an electric SUV, rather than a bodystyle better suited to eco-friendly motoring. A tall stance and chunky proportions don’t immediately lend themselves to the best-possible aero performance, but then again a sensible car company will need to build cars people actually want to buy, too. So there we have it. No off-roading for us on this trip, and while it might have a slightly rugged look, the E-Niro is unlikely to be tackling anything tougher than a kerb or two. Heading back south away from the border and towards Seoul on some of the twistier roads in the region, it was time to engage Sport mode and give this crossover some stick. It was largely as we’d expected, frankly, with numb steering and a touch more bodyroll than we’d prefer to stitch a set of switchbacks together. But once you’ve got your head around the extra movement, we found the chassis predictable and nimble when applying steering inputs. It’s no Hyundai i30 N hot hatch on the twisties, but again the E-Niro doesn’t fall apart when keen driving is demanded of it. Parking up at the end of our long day’s driving, the range read-out on the instrument panel said we’d still got over 100km (62 miles) left in the batteries. Considering this test was meant to challenge E-Niro in conditions as close to real life as possible, we came away very impressed. The E-Niro looks very similar on paper to the Kona Electric, but don’t let that fool you. We think there’s enough vim and vigour here to make waves in its own right, and can see the appeal of E-Niro over parent firm Hyundai’s attempt. With its genuine 300-mile capability and useful, modern technology, the E-Niro feels like the new normal.